In this family, we roll up hard into the public library. Which, consequently, might be the nerdiest sentence I have ever typed, but I kind of love it about us. Prior to our visit, there is typically heated discussion regarding exactly which books will get returned. My minis can debate pretty intensely for “just a few more days” with their favorites. So I can read them again. And again. And again. And once more for the cheap seats in the back. With feeling! As a teacher, I know the value of repeated reads of favorite books. For my Mini Mister, who is two, these re-reads allow us to discuss vocabulary, build schema, study each illustration, get a sense of what is happening in the story and luxuriate in the sounds of different characters’ voices or rhyme. 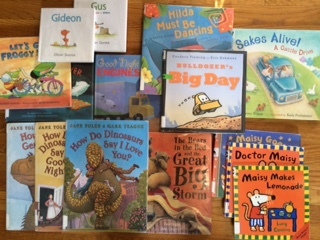 For my Mini Me, who is five, multiple readings let us discover new things about a character, dig deeper into personal connections to the text, talk about the meaning of tricky vocabulary and grow a strong sense of what makes this story worth reading again and again. Regardless, I think it goes without saying that I sometimes want to poke myself in the eye with a fork when they beg for a fave yet again. Once I think I rolled my eyes so brilliantly that I might have fainted. But I read it. And then I read it again. I overheard another mom at the library saying, “Why don’t we try to get some different books this week? You might find something else you like.” And she’s right (or just advocating for her own sanity, which I get too). But by reading and re-reading favorites, many minis are gaining a sense of what they like by building a strong foundation of stories that resonate with them for one reason or another. In the classroom, I always advise teachers that less can sometimes be more. We can model falling in love with books and reading by returning to our personal favorites as well as favorites of our students. Wave your nerd flags – let your students see your excitement to share those books that you love deeply. Talk to them about what make you love that book, story or author so that they can begin that own dialogue with their own reading selves. I sound like such a hippie…someone get me a guitar! I will sing this whilst making you a hemp necklace. But I really do believe all this. I am most excited about this new Eve Bunting series, Frog and Friends! Obviously, my Mini Me is currently obsessed with The Berenstain Bears collection. We also love Iris and Walter, Oliver Pig and Annie and Snowball. Together, we have been reading aloud from the Rainbow Magic series. The whole family loves the dinosaur books by Jane Yolen. (I secretly want to hang out with her. 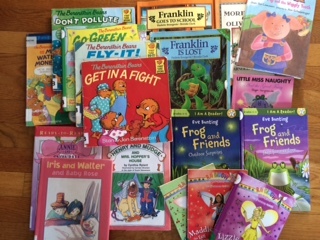 #notasecretanymore) We also have a small obsession with Maisy, Froggy and the Gossie books. Bulldozer’s Big Day is perhaps our newest favorite. I discovered something new on the fifth read – seriously! Keep reading! (And then read it again)!